While there’s no rush to get your pre-baby body back, exercise can be a great mood lifter and body strengthener for new mums who might be lacking energy or feeling overwhelmed with a newborn. Don’t think you have time for fitness? Try these seven simple and fun ways to exercise with your new baby along for the ride. Babies love movement and music! Crank the tunes and rock out with your little one in your arms or in a carrier. You can even place them in a bouncer and entertain them with your dancing moves. There are now lots of great exercise classes specifically designed for parents actually carrying their babies – such as aerobics, dancing and yoga. 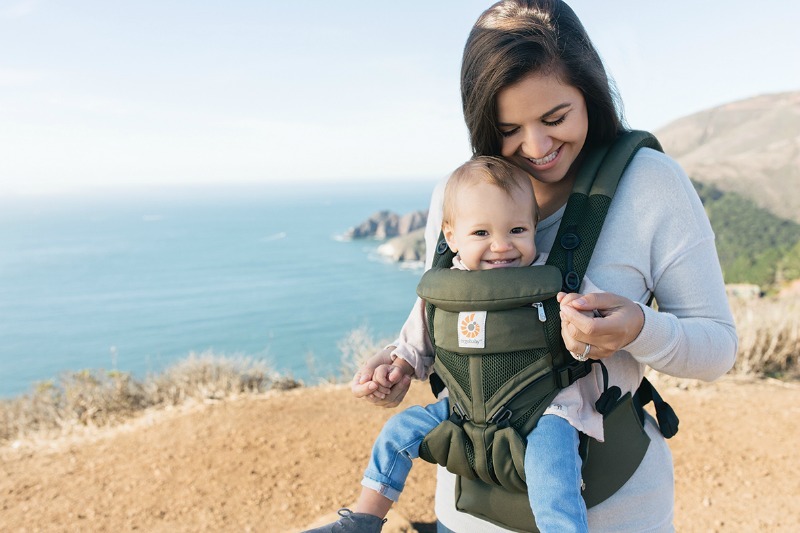 The Ergobaby Omni 360 Carrier Cool Air Mesh is perfect for this, keeping your baby snug and secure while also cool with its breathable material. Suitable for newborns up to 36 months with adjustable straps and lumbar support (so you don’t do your back in! ), it’s a great investment at $299 and means you can work out with your baby right there with you the whole time. Mix up your routine up by teaming up with other new mums, like your mothers’ group. Swimming is great for this as you can take turns doing laps and minding each other’s babies in prams. And if there’s an issue you’re right there if you’re needed. There’s nothing easier than stepping out the front door and going for a stroll with your baby. You’re out in the fresh air and sunshine, moving your muscles, you don’t need a sitter, and it doesn’t cost you a cent! Pram pushing is great if your baby likes it, but a baby carrier is also a great way to roll. No need to coordinate times with sleeps, it’s great for bonding and your hands are free to hold a dog’s lead or another child’s hand, or pick up a coffee and a few groceries along the way! You could even organise a group walk with some other local mums in the area. 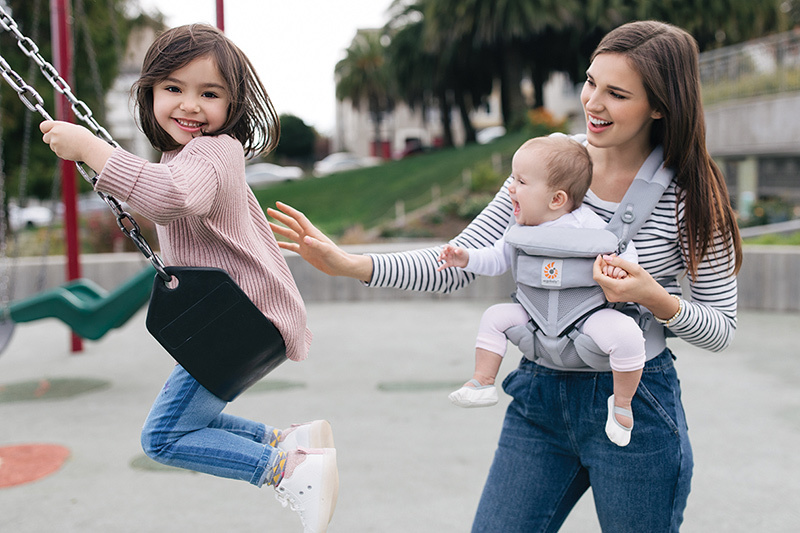 Pop your baby in a carrier like Ergobaby and the exercise options are endless without even having to leave the house! Go up and down your stairs, do lunges in the kitchen, clean rooms, hang out laundry and more. The extra weight carrying your baby while you do these everyday tasks will give them a lot more impact. And when they can crawl, try following them around on the floor for some extra fun calorie burning! No time to hit the gym? Turn the playground into your exercise arena instead! Try some swing-pushing, monkey bar chin-ups or even some see-saw squats. Sure, you might get some funny looks from other parents, but you’ll leave feeling fitter and more energised. There are so many great exercise videos on YouTube or DVDs now, meaning all you need is a TV or smart device and you’re away. Cost effective and convenient, yoga is perfect for this format as you can lay your baby down on the mat with you as you do gentle stretches and strengthening exercises. Or better yet strap them in a carrier and let them join in the fun. What other exercises have you done with a baby? Share your tips on our Facebook page!